Spain holds a hallowed place in the hearts of many foodies all over the world. This beautiful country is not only home to some of the most spectacular places on the planet, but also to some of its most spectacular food. Many travelers come to the Iberian Peninsula in search of the best Spanish food, which goes beyond simply tapas and paella. Though, having said, that, you’ll want to try those, too! One thing that makes Spanish food special is that each region has its own unique flavors and specialties. What you eat in sunny Andalucia in the south will probably be quite different from the food you enjoy in rainy Galicia in the north, even though both are known for their excellent seafood. We’ve logged plenty of time in restaurants all over Spain (it’s a tough job, but somebody’s got to do it) to find the very best Spanish food you simply can’t leave the country without trying. Now the question is, who’s hungry? Ask a local in Spain what food they couldn’t live without, and chances are good they’ll say jamón. These dry-cured hams are eaten cut into paper thin strips. Though both similar, jamón ibérico is cured for much longer, comes from a different types of pig, and is generally more expensive. 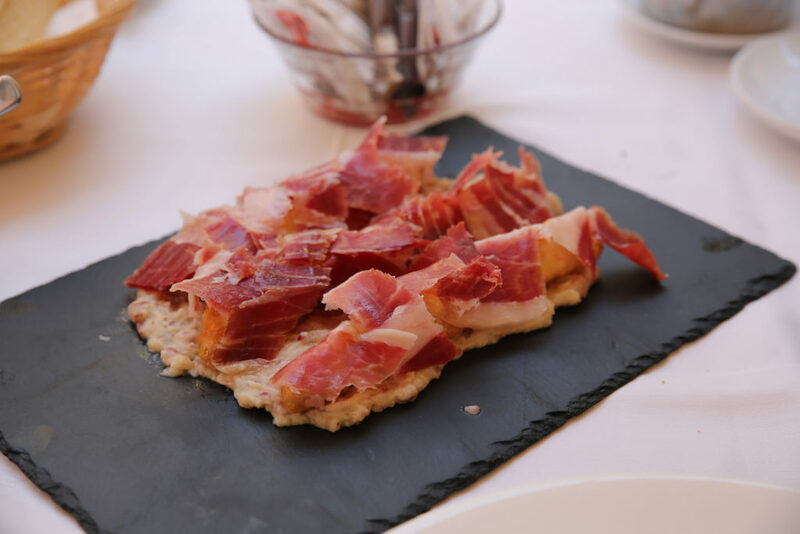 Triangular slices of Manchego cheese are often enjoyed on a charcuterie plate with jamón, and they make a perfect pair. This aged cheese will almost certainly become a fast favorite for many a foodie, especially vegetarians who can eat it in lieu of cured meats. For a sweet treat, enjoy it with membrillo (quince paste). Often translated as “Spanish omelette”, this egg and potato dish is more like a crustless quiche. It can be enjoyed either hot or cold, and is often served by the slice in tapas bars. Just one taste and you may find yourself hooked. Some like it with onion, others without, but most people agree that this is one seriously tasty dish. 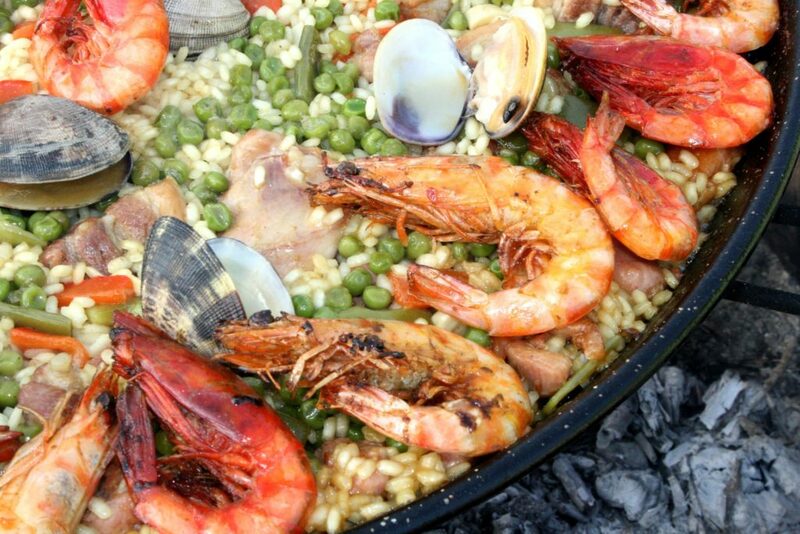 While it’s all too easy to get a bad paella in Spain’s main tourist destinations, a properly cooked one can be sensational. This rice dish hails from Valencia, and the traditional recipe includes green beans, chicken and rabbit, snails, and saffron. However, you can find all sorts of variations, including seafood paellas, meat ones, and vegetarian options to suit different tastes. These small oval-shaped tapas can be filled with anything from meat and fish to cheeses. Traditionally made with bechamel sauce, formed into small logs, and coated in breadcrumbs, croquetas are a sure crowd-pleaser. Order a few different types to sample. Usually served with sliced potatoes and paprika, Galician-style octopus is tasty enough that people who don’t eat seafood might enjoy it. The octopus is perfectly cooked until it’s tender and full of flavor. Both gazpacho and salmorejo are cold tomato-based soups enjoyed in Spain in the warmer months. Gazpacho is better known, and is the lighter of the two, made from fresh veggies like tomatoes, cucumbers, and peppers. Salmorejo is similar, but combines mainly tomatoes, bread, and vinegar. Why not do your own taste test to decide which one you like better? Treat yourself to something sweet with this indulgent Spanish treat, often eaten for breakfast. 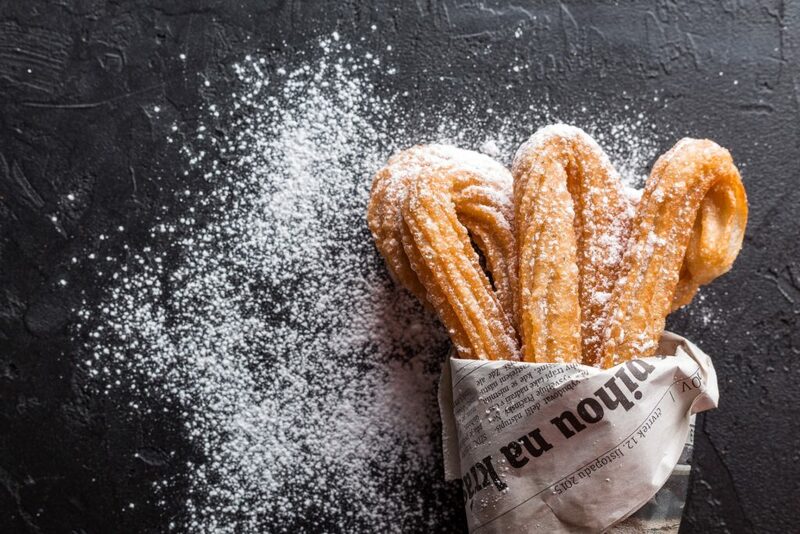 The churros are crispy fried dough shaped into long tubes, and often dusted with sugar. They’re best eaten dipped into a sinfully thick mug of hot chocolate. Churros and chocolate make the perfect breakfast on a cold winter morning, or after a long night out. Which Spanish foods are your favorites? Let us know in the comments which ones you’d love to eat!